Depending on where you look, broadcast-audio education is either surging forward or barely there. A handful of high-tech for-profit media-arts schools have invested substantially in broadcast platforms. Arizona’s Conservatory of Recording Arts & Sciences (CRAS), for example, regularly takes its 42-ft. expando mobile production unit to NFL, MLB, and NASCAR events and connects its Studer Vista 5 console to NBC Sports and Fox Sports trucks via MADI and fiber. Two full MADI streams — up to 128 channels — take in all of the event’s audio, including in-car sound and comms. It’s part of the school’s sports-broadcast program, instituted in 2013 and based on a curriculum developed by Fred Aldous, audio consultant and senior mixer, Fox Sports. Full Sail University recently installed a Calrec Summa broadcast console at its large campus near Orlando to support its recently reinvigorated broadcast-education program, a component of its larger Show Production bachelor’s-degree track. An estimated 300 students pass through the course each year, a small percentage of the school’s 4,000 or so students but a larger percentage than in the broadcast program’s previous incarnations, according to Education Director, Audio Arts, Dana Roun. Broadcast-sports courses at the school were begun in 2012, fostered in part by a formal relationship with ESPN. Since late 2010, under the Sports Lab Powered by ESPN program, the sports network had used students and graduates on shows and as interns. However, the program has lost steam in subsequent years. Sports Lab was mutually terminated in 2014, but Roun says the school recommitted itself to broadcast education as part of a comprehensive refurbishment of its media-arts curriculum last year. The school is also continuing its three-year-long partnership with the WWE’s NXT series, episodes of which are taped in the Full Sail Live Venue, with students staffing many of the production positions. The school also added an EVS video-management system and implemented DANTE networking to move its audio-signal transport to a network. The school is also considering acquiring its own mobile production unit in the next year. Educators paint a chicken-and-egg picture of broadest education. On one hand, schools are reluctant to incur the investment expense necessary to provide students with contemporary broadcast-audio platforms if incoming students show little interest in the industry. (Students tend to be attracted to the vocational colleges by music-production courses; state schools’ broadcast offerings tend to be a very small part of the overall curriculum). On the other hand, broadcast professionals fault schools for not fostering that interest and creating demand, through more-aggressive marketing, that could justify the expenditures. Others in the industry see the increasing move of television, including sports, into a streaming environment, suggesting that IT-centric students might be more receptive to applying that knowledge to sports production: a shortage of conventional broadcast-audio–console jockeys may someday be counterbalanced by hordes of competent coders putting sports online. Major sports leagues are already pursuing ways to integrate broadcasts with virtual- and augmented-reality platforms, areas where such synergy might blossom. 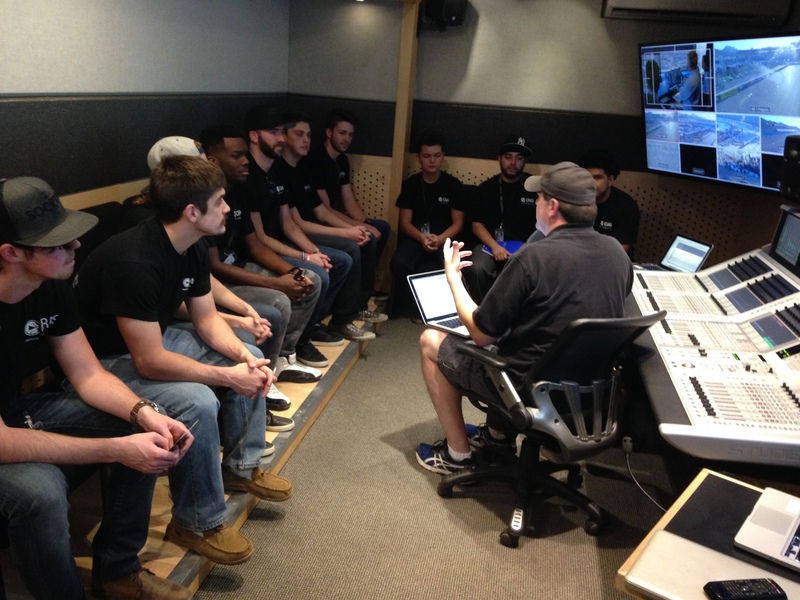 Gina Milewski, course director, sports broadcast engineering, Full Sail, sees potential in network-savvy students’ applying those skills to streamed sports productions. With the decline of apprenticeships at heavily unionized networks, broadcasting’s own response has been mainly ad hoc. Most notably, the DTV Audio Group’s online-training initiative — supported by Fox, ESPN, Turner, and others — offers courses in loudness management and 5.1-surround mixing. Two new training modules are currently under consideration: on object-based audio and on edit workflows around 5.1 surround sound. But, at best, these can address only narrow aspects in what needs to be a more comprehensive approach to education. That seems to put the ball back in the educators’ court, but many remain skeptical or even pessimistic. “There is just little or no training at all available, especially for freelancers, and that’s a problem, the reason being that it takes a lot of time and energy to develop a meaningful training program — time and energy most entities don’t have,” observes Dave Evans, a longtime industry consultant, an adjunct professor of sports broadcasting at Baylor University, and a coordinating producer for studio programming for Fox Sports Southwest, Oklahoma, and New Orleans. “There’s no centralized resource that the industry can tap into, such as the NAB and InfoComm, which supervise extensive and centralized training programs for members, whether they’re freelancers or not,” he continues, noting that his course, like others, relies on guest lectures by working professionals and field trips — he has a class visit to an NBA-game production planned for this year — to flesh out textbook content. But he believes the broadcast business will eventually figure out a useful organized solution, “in time,” he says, cautiously. Finding a way to communicate that concept to an incoming college freshman is the magic bullet that both schools and broadcasters are still looking for.